Gorgeous BROADMOOR English Tudor ~ Delightful Holiday Home, Hot Tub & Gazebo !! Wonderful Residence minutes away from Broadmoor Hotel !! Merrywood Manor, an Exquisite English Tudor, vine covered and set amidst towering pine trees, to have your special event or private retreat. CLIENTS MUST REVIEW CONTRACT BEFORE BOOKING. PLEASE CONTACT MANAGER/719.287.6105 FOR STATED DISCOUNTED RATES OR CANCELLATION POLICY AS SITE IS UNABLE TO APPLY DISCOUNT OR CHANGE IN CANCELLATION POLICY TO YOUR QUOTE. IF YOU WISH TO BRING A PET PLEASE CONTACT ME FOR AN ACCURATE QUOTE AND ADVISE TO TYPE. PLEASE LET US KNOW IF YOU HAVE ADDITIONAL NEEDS OR REQUESTS. 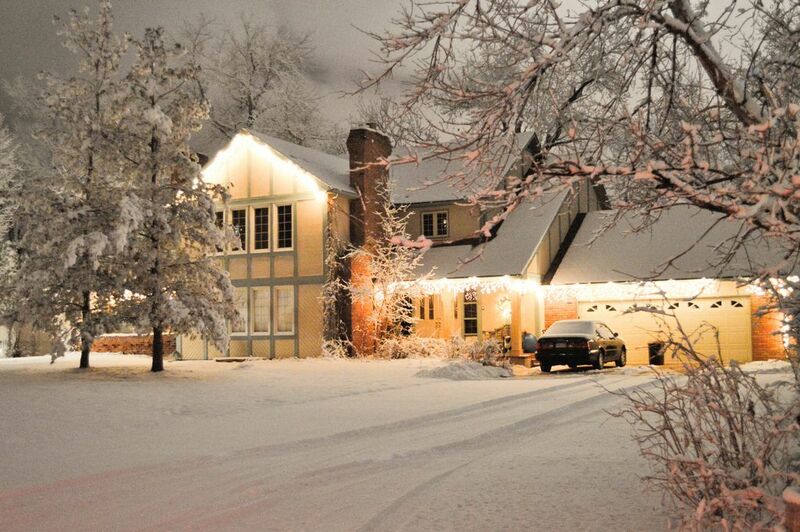 Home has open flow plan and filled with lots of lights in a wonderful neighborhood. Well-appointed and ready to make great memories anytime of the year. Home designed and furnished by interior designer Diane Estey and is professionally decorated for the holidays ! As you walk through the front doors and into the formal foyer, French doors lead to a two story beamed living room with large fireplace, and its own private patio. The formal dining room is grand and boasts seating for ten with a garden view. The gourmet kitchen is exceptional with lots of counter space and a wonderful butler’s pantry just across the hall. The breakfast room is always filled with sun and through French doors one will find themselves on another patio with a fountain and eating for ten. The family room on this level affords a view of Cheyenne Mountain and Will Rodgers Shrine and again has a large arched fireplace with French doors to the patio. Also, a big screen TV! Upstairs you will find four bedrooms, two bathrooms and a high ceiling-ed library, stocked with books for your enjoyment. The master bedroom has two private viewing decks, a wonderful bathroom with Jacuzzi for two, separate shower, dual sink vanity and dressing room. Downstairs we enter the second family room with wet bar, study, bathroom and the fifth bedroom. This area can be totally private from the rest of the house. The family room on this level can also be used as a sixth bedroom with a queen bed. This lovely private home is filled with lots of special accents and beautiful antiques. There is a large entertainment deck with large hot tub to enjoy our beautiful Colorado evenings. The world famous five-star hotel, The Broadmoor, is just five blocks away, with lots of tourist attractions close by along with great shopping and entertainment. Walk to The Golden Bee and enjoy English ambiance in a true English Pub. So, bring your family and friends to experience this exceptional getaway! *This is not an event destination, due to code restrictions we are unable to have events at this property. The most beautiful location in Colorado Springs and 5 blocks from the Historic Broadmoor Hotel and 5 minutes from the Cheyenne Mountain Conference Resort! Gorgeous Mountain views on over one half acre of landscaped grounds, gardens and fountains, several patios/porches, well lit, and uniquely wonderful floor plan. Privacy, beautiful trees and mountains, huge front and back yard, hot tub, and living like a queen or king in our wonderful vine covered English Tudor. *Broadmoor Hotel, Seven Falls, Cheyenne Mountain Zoo, Helen Hunt Falls, Old Stage Road, Will Rodgers Shrine (You can hear the chimes!! ), miles of marked hiking trails, Gold Camp Road, Discovery Center, Broadmoor Towne Shopping Center, World Arena, Golf, Horseback Riding, and only 5 minutes from upscale Downtown Colorado Springs. Outside access to hot tub bathroom. Downtown Colorado Springs, Manitou Springs and Old Colorado City. Five Star Broadmoor Hotel and resort just minutes away! Secure off street parking in private driveway. Pantry includes sink, wine storage, microwave, mixer, blender and lots of extra items for your special meals. Fully Equipped! Everything you could think of! Enjoy all of our books in our library! Great large yard with fenced in backyard! Manor has wonderful English feel with lots of vines, draping the manor through most of the year. Overlooking 28' beamed timbered living room from stocked library with 9' ceilings, making a wonderful large sitting area and also offers a large sleeper. Kayaks and Canoes can be leased at most of the lakes in! the area. Also, for the more adventurous please check out Canon City for White Water Rafting which is close by and a pretty drive. We have several bike rental shops in the arena which also offer off road and mountain bikes. Several throughout home, upper and lower floors! Master bedroom with both south and north decks, inclusive of views of mts., shrine and gazebo/recessed hot tub. Most ski resorts do have rentals available. We also have several nearby shops which you outfit you and you will be already to hits the slopes as quick as possible. Tennis courts are available at Bear Creek Park which is about 5 minutes away....play at night too! Golf at one of the many golf courses available throughout the area. Broadmoor Hotel and Resort provides closest courses with the Cheyenne Mt. Conference and Resort also with wonderful course. 6 people with areas built in for both sitting and laying down. Hard Woods floors, crown molding, high beamed ceilings, Gourmet kitchen with Butlers pantry, Large Entertainment Deck in Back Yard with gardens and fountains, and a great historic feel of the Original Polo Pony Field. This was a comfortable home in a great location. The owners were very easy to work with and they had everything there for ease of staying there and not having to buy paper products, laundry needs and bathroom essentials. They plan for you enjoying your stay and not worrying about the small things. We want to go back for sure! Overall my group and I enjoyed our stay, as it was not only close to our event but the house was immaculate and comfortable. And our host was very hospitable as well. We had a wonderful weekend in the house. Just as advertised. We will be back next year. A lovely, spacious home in a beautiful neighborhood. We had ample room for our family. The house offers large common areas and a kitchen that provides the space and necessities for cooking, This lovely home gave our large family a place where we could all be under the same roof for the holidays. Thank you! The family had a wonderful time during our stay. The location was ideal for the activities we had wanted to accomplish. Terry was excellent, response and helping with everything and anything we needed. We are already considering about a return to the same home. Thank you again Terry, Phantoms forever!! Gold Camp Road, great shopping and entertainment. Farmer's market is throughout the season and numerous parks hold outside concerts. White water rafting and the Bishop's Castle are located in Canon City which is less than an hour's drive. Cripple Creek provides an unique experience with numerous mines to explore, a train which runs throughout the area and great casinos. CLIENTS MUST REVIEW AND COMPLETE RENTAL AGREEMENT REQUIRED FOR BOOKINGS WHICH INCLUDES PET DEPOSITS, PROTECTION POLICY, REFUNDABLE DAMAGE. ADDITIONAL GUESTS $25.00/NIGHT OVER 14. SPECIAL DISCOUNTS AVAILABLE FOR STAYS LONGER THAN 30 DAYS. PLEASE CONTACT 719.287.6105 FOR ADDITIONAL REQUESTS OR INFORMATION.